Last night with no book on the go, I picked up Peter Pan for the first time in years and read the first three perfect chapters before going to bed. We all have our favourite opening lines but few (even my favourite “I write this sitting in the kitchen sink”) match Barrie’s wonderful ”All children, except one, grow up.” Is it possible to put the book down after reading that? To not wonder who that one child is and why – and how – he doesn’t grow up? In that one short sentence, in those six simple words, is the promise of the entire story: of Neverland and Captain Hook, of Tinker Bell and the Lost Boys, of all the extraordinary things that happen to the Darling children that every child and most adults wish would happen to them. It is magic and it works just as well on me at twenty-six as it did at six. You must be an incredibly fast reader! The Art of Fielding in an afternoon! Wow!! I remain impressed and humbled by your thoughtful and intellectual posts. as you have all the unique gifts of a superb critic. What makes your voice so interesting is you are completely disconnected with the trash that is being published today and reflecting on the very best of the past century with your own voice. I am so enjoying the education. While I agree with you about the opening sentence, I still prefer this in its original form as a play. Barrie was pushed into the novelisation as an afterthought and although this does make the story available to a wider public for me it doesn’t work. The moralising is too heavy handed here. He was a much better dramatist than novelist, I think. I hadn’t read this until a couple of years ago, and was surprised by how witty the whole thing was. Although why it surprised me, I can’t imagine. Ah, the magic of a good book! It’s been a while since I read this one, but you make me want to plop down and read it aloud to the kids again. I immediately smiled when I read your favorite opening line, from I Capture the Castle, a favorite of mine, too.
. . . and me at 62! I really must read this again soon, while there is still some childhood in me, Claire. Alas and alack, I can’t quite yet as I JUST last night started the book from which your other favorite opening lines hangs. This is one I’ve always been able to read over and over again, even in my adult years. I had no idea it was a play first, as Alex’s comment points out. 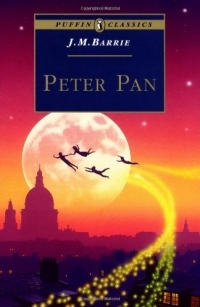 I haven’t yet read Peter Pan, but I’m very much looking forward to it. P.S. I wanted to cry with joy just reading ‘I write this sitting in the kitchen sink’ in this post. I read I Capture the Castle for the first time in January: knocked. my. socks. off.